By late 1940 Great Britain was increasingly unable to pay for and transport the war materials it needed in its fight against Nazi Germany. Britains Prime Minister Winston Churchill appealed to President Roosevelt to find a way for the United States to continue to aid Britain. FDR proposed providing war materials to Britain without the immediate payment called for in the Neutrality Act. 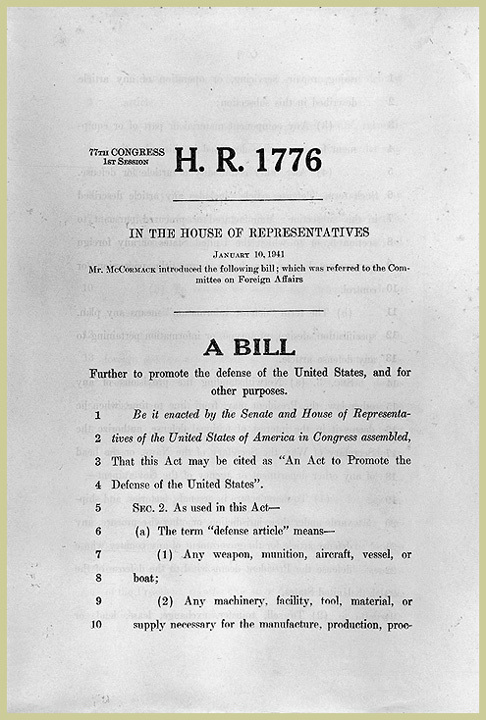 A bill, assigned the patriotic bill number "1776," was introduced in the House on January 10, 1941, by Representative John McCormack of Massachusetts. After extensive hearings and debate, Congress passed "Lend-Lease" and President Roosevelt signed the Act on March 11, 1941. After the United States entered the war, Lend-Lease became the most important means for supplying the Allies with military aid.